On the occasion of International Women’s Day, 8 March 2018, the Ministry for Foreign Affairs staged a special day dedicated to women’s rights around the world, an event that brought together different personalities. 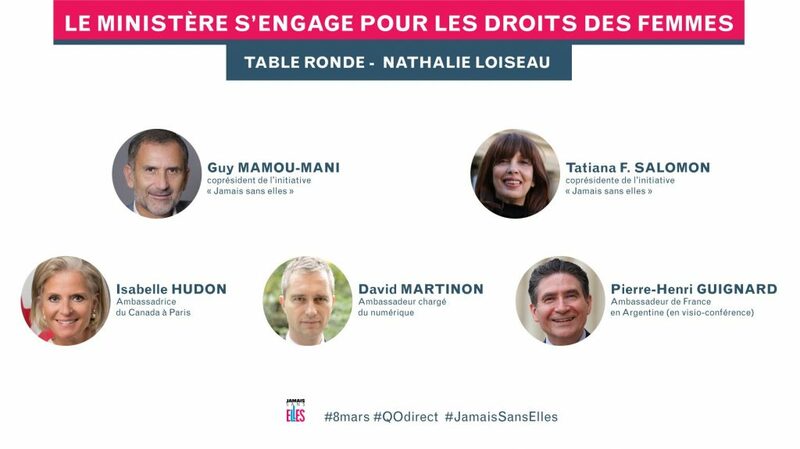 The ministry invited #JamaisSansElles for a round table devoted to action in favour of gender diversity. Jean-Yves Le Drian, Minister for Europe and Foreign Affairs, joined forces with #JamaisSansElles during the presentation of France’s International Digital Strategy at “The Camp” on 15 December 2017. Other announcements were made during the event, which will solidify the partnership between the French diplomatic corps and #JamaisSansElles. Pierre-Henri GUIGNARD, French Ambassador to Argentina. Chairperson : Sylvain ATTAL, journalist, founding member of #JamaisSansElles.